When I began baking a few years ago, I started with chocolate cake. It is every one’s favourite, especially so Amit’s (my husband). My experiment turned out pretty well, and then came numerous repetitions and variants. Of late, I graduated to trying my hands on different flavours. Being a fruit lover, a fruit cake was the obvious choice. Cooking and baking for me is like painting on a canvas; I have some colours (the aromatics spices to the colorful vegetables and fruits) and a vague idea of what I want to express….sometimes sweet, sometimes sour and sometimes just anything…I just set out and try to come up with something beautiful. Incidentally, this is why I named my blog ‘Hungry Palette’- my canvas in the kitchen that brings together the cook and the painter in me. 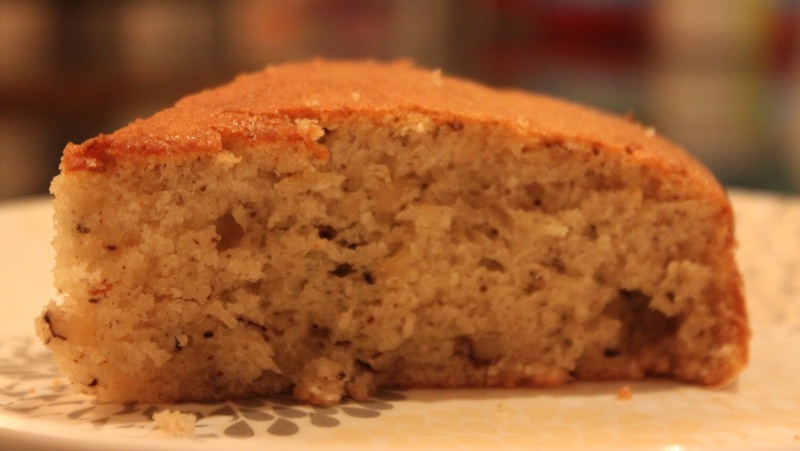 Here is the fruit cake recipe – I wanted to try out something with bananas and walnuts, so combined the base recipe of a cake with these ingredients and what turned out was a wholesome, fluffy and moist cake – the refreshing flavour of banana and the crunchy texture of walnuts makes this cake perfect for weekend brunches. The best part is that it’s not very sweet….I bet it would be difficult for you to eat just one slice!! This cake can be served with Vanilla ice-cream or whipped cream.